tech that makes me drool. I need to prioritize and bargain shop and Walmart is always on my bargain shopping list. Here, in no particular order, are some tech items that I’d love to get for Father’s Day. All of these items were spotted during a recent stroll through our local Walmart. 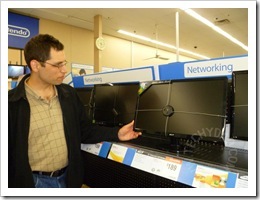 They are also all available from Walmart’s Father’s Day electronics page or Walmart.com. Playing video games is fun. Playing video games with my boys is extremely fun. NHL, while not a master, has learned how to operate the controls nicely. JSL wants to work it right, but just can’t figure it out yet. I think he just needs more practice. Which means I need to play more video games with him. Oh the never-ending chores us dads must undertake! Yes, we already have two Roku players. One in our living room and one in our bedroom. Why do we need a third, you ask? Well, our upstairs room (used by the boys as a play room) doesn’t have one. 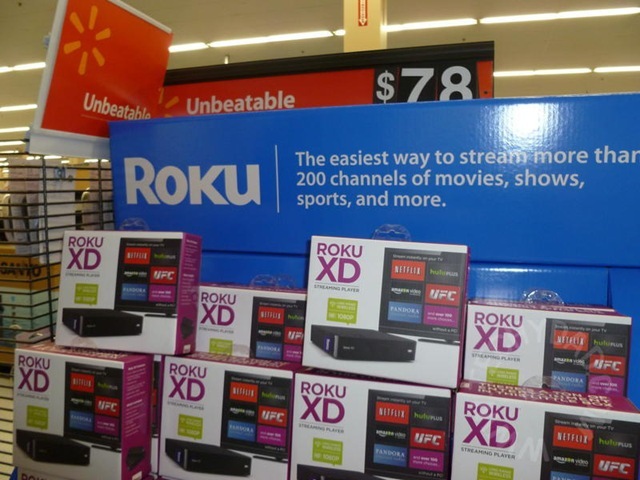 In fact, since it only has basic cable TV (and a DVD player but the DVDs are kept downstairs), that TV would benefit greatly from a Roku player. Plus, the boys could rock out with Pandora in the larger play room space. Don’t ask me how we didn’t get a photo of this. 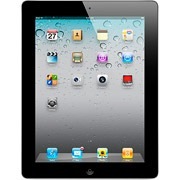 I drool over the thought of having an iPad to use. Oh the web browsing I’d do. The apps I’d download. The Angry Birds I’d fling at green pigs. Excuse me while I get my drool mop. I recently inherited a desktop computer that my parents didn’t need anymore. I want to set this up to be a print/file server, but I need a monitor. I have two CRT monitors I could use but they are big, hulking affairs. They work fine, but they take up so much desk space. How much nicer would it be to have this slim number on the desk instead of the giant dinosaur? 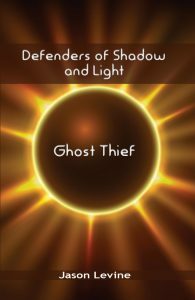 Disclosure: I wrote this review while participating in a blog tour by Dad Central Consulting on behalf of Walmart and received a promotional item to thank me for taking the time to participate. 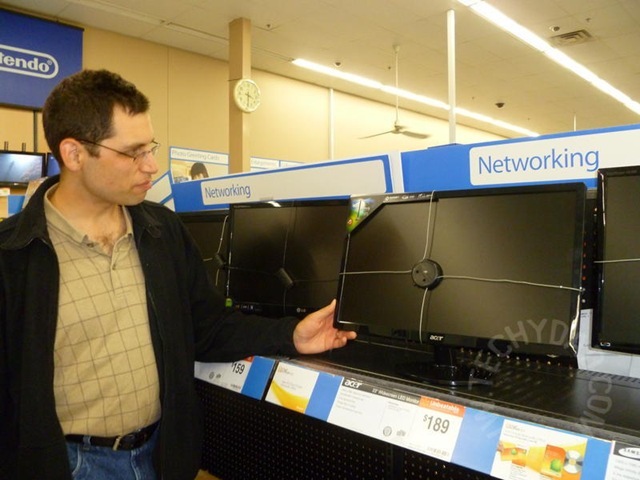 Last year, I wrote about how I would love to cut the cable cord and stop paying for cable TV. At the time, I assumed that DVD rentals/purchases (including services such as Netflix), in-home streaming (via purchased and ripped DVDs) and the Internet would pick up the slack from our loss of cable TV. After all was said and done, I figured that cutting the cable cord would save us $15 a month. Not much, really. Later on, I actually won a Roku and tried out Netflix. This resulted in a four part series titled Netflix, Roku and Cut Cable, Oh My!. (Here are links to part 1, part 2, part 3 and part 4.) During this series, I revised my estimates, including purchasing equipment to receive OTA signals and a TiVo box to record shows. I also cut back on Amazon VOD and purchased DVD estimates. At the end, I wound up estimating a savings of $40 a month. Since it has been about year, I figured it was time for a follow-up. First of all, our cable cord is still fully intact. Despite our calculations of what we would save, it turns out that too many of the shows we like watching are on cable TV. Still, our television landscape has changed dramatically in the past year and it doesn’t bode well for the future of the cable cord. First of all, that three month Netflix trial turned into a paid-subscription. Yes, this is $13.99 extra a month, but it is well worth it. We get 2 DVDs out at a time and unlimited streaming. Thanks to our Roku box, we can watch videos streaming from Netflix on our television. The kids have taken to this the most and will watch the same shows over and over. They even request “Roku” (by which they usually mean Netflix on Roku) over regular TV on a regular basis. Paid rentals and DVD purchases have gone virtually extinct. Yes, we’ll buy the occasional DVD, but this is a rare event. Meanwhile, our trips to the library to take out DVDs have become a nearly weekly event. 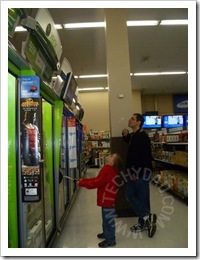 The boys get excited to go to the DVD section and pick out 1 DVD each. Then they can’t wait to get home and watch it over and over until it is time to return it and pick a new DVD. This is quite a deal since it is essentially free. “Essentially” because it is paid for via our taxes, but I can think of worse ways to spend tax money than beefing up our public libraries. Besides, the boys almost always get books while there too. We’ll leave with three or four DVDs and a big bag full of books. 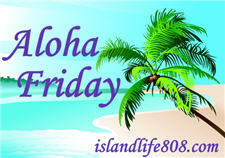 Still, there are cable channels that we just love watching too much to cancel. If these shows were available in a streaming model (say, via Hulu Plus, Netflix or some other provider), we would gladly subscribe to those and ditch the cable cord. Until that happens, though, I don’t think the cord will get sliced. Of course, as more content goes streaming and as we watch less and less non-streaming content, the cable cord’s lifespan seems more and more limited. I’d probably be safe to declare that we won’t cut it in the next year, but I wouldn’t be as sure about the next 3 – 5 years. When we moved into our house, our computer systems went upstairs. Over time, though, we found that we were using the downstairs more. This was aided by the addition of a wireless router and our laptops. 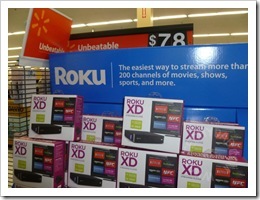 When we added our Roku and CinemaTube, we hooked them up to our wireless network. This was a fine solution, but wireless is slower than direct Ethernet hookups. Unfortunately, running network cable throughout our house wasn’t an option due to the age of our house and type of walls it has. That, plus we had enough home repair bills without drilling through walls just to run cable. Enter the LinkE. The LinkE, from Brite-View, uses Powerline Networking technology to connect your devices to your router. Put simply, the traffic flows through your router, into the LinkE bridge, through your house’s power lines, through the LinkE switch and to your device. If that sounds complicated, all you need to know is that you plug the bridge into an electrical outlet near your router, connect it to the router and then plug the switch into any other electrical outlet in the house. After connecting a device to the switch, you have Internet access. I took the LinkE out of the box and plugged one unit in downstairs near our TV. I plugged the other unit in upstairs near our router. I was actually expecting more setup than that. I figured that I’d need to log into some administrative panel and fiddle with some settings or something. Instead, it was literally plug and play. When I hooked it up to our Roku, our Roku was able to tell that it was connected to a wired network and could use that instead of the wireless network. Before you could say “powerline networking”, Netflix movies were streaming through our power lines and onto our TV. This was highly convenient, but it wouldn’t be much use if the speeds didn’t meet or exceed wireless network speeds. 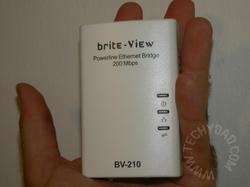 Brite-View advertises speeds up to 200Mbps, but, since my ISP doesn’t give me that much bandwidth, I didn’t expect to reach that figure. Still, I wasn’t dissappointed. The Netflix loading seemed to go faster and, when I connected it to my computer, my web page load times seemed to shrink. Of course, I’m too much of a geek to accept “seemed to.” I want hard numbers. To quantify just how much of a boost I got, I ran six speed tests at DSLReports.com. First, I ran three using my wireless connection. This resulted in an average speed of about 1984.7 Kbps down and 988 Kbps up. Next, I ran three tests while connected via LinkE for an average of 2414.7 Kbps down and 1000 up. (I cleared my browser’s cache after each test to avoid any influence there.) The upload speeds were comparable, but the download speed improved by 22%. I would definitely recommend the LinkE for connecting home theater equipment to the Internet. 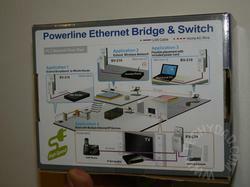 Nowadays, many electronics (Blu-Ray, Roku, CinemaTube, etc) come with ethernet ports. Not all come with wireless built-in. 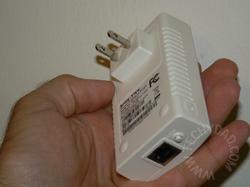 Instead of buying wireless adapters for each of these, you could hook up one LinkE and network all of our devices. 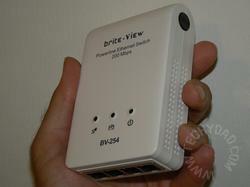 The LinkE can be purchased from Brite-View. 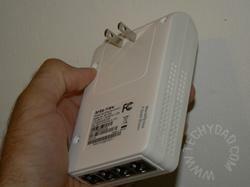 The 1 port bridge + 4 port switch model that I tested retails for $84.99. 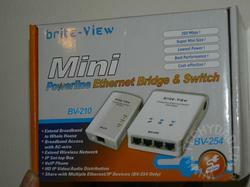 Disclaimer: I recieved the LinkE 1 port bridge + 4 port switch model complimentary from Brite-View to test. No other compensation was given. The opinions expressed above are my own.